On February 18th, Ugandans went to the polls for national elections to contest the fifth consecutive term and 30-year reign of President Yoweri Museveni in what some observers predicted would be his most competitive election yet. In the lead-up to the election, international media outlets raised concern about a consolidation of power by the ruling party and growing climate of intimidation. A report by Human Rights Watch documented myriad threats to free expression among journalists, media groups, and civil society organizations, and the Committee to Protect Journalists chronicled a series of repressive measures in the weeks preceding the election. The morning of election day, widespread reports decried the full-scale blocking of popular social media (Facebook, Twitter), instant messaging (WhatsApp), and money transfer (Mobile Money) platforms. Mobile telecommunications provider MTN tweeted that the blocking had been ordered via directive from the Uganda Communications Commission, the national regulatory body due to threats posed to public order and safety. 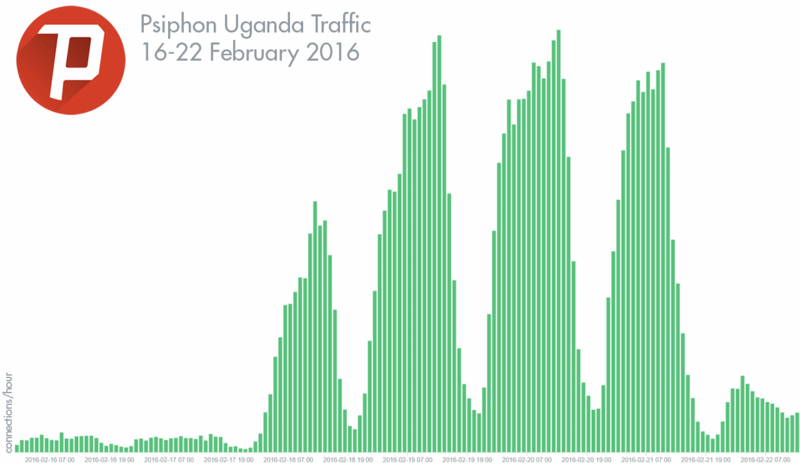 Ugandans rapidly turned to VPN software and other proxy tools in order to bypass the blocking, with an estimated 1.4 million downloads for Android. Psiphon use increased dramatically as netizens connected through the circumvention network to restore their right to communicate and access information. Psiphon statistics indicate growth in hourly connections during the blocking period of up to 25 times baseline usage. The case demonstrates that in response to censorship, blocking, and other restrictions, internet users will turn to known tools that connect them to content and to each other.